King Kongmin's tomb (photo provided by Paul Tanner). 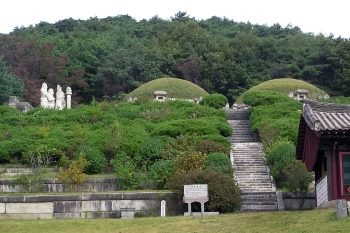 The Historic Monuments and Sites in Kaesong represent the ruling base of the Koryo dynasty (918-1392) with their associated tombs. The Koryo unified the country. During their reign Confucianism began to prevail over Buddhism. The city was developed in a geomantic setting, using the surrounding mountain tops as markers. Kaesong is the southernmost city of North Korea. It used to be one of only two locations in North Korea accessible from the south (until May 2010). We were taken on a whirlwind tour of Kaesong city. 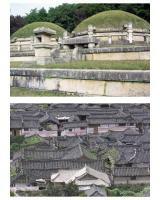 Within less than two hours we got to see the Sonjuk Bridge, the Namdaemum, the Koryo Museum and the tomb of King Wang Gon. Most visitors I think get to see the museum. The bridge was thrown in because we had lunch at the nearby restaurant (which I discovered to my surprise was within the core zone) and some of us asked to see it. That particular tomb was chosen instead Kongmin's, I cannot help but suspect, because Wang Gon was the founder of the Koryo and credited with unifying the Korean nation. And we drove by the Namdaemun twice, when entering and leaving the city. We found out that the tomb of Wang Gon could be entered at a lovely price of 100 euros per person. I am not quite sure what to think of what I had seen. There was hardly any time to absorb anything and the guides were bent on ensuring that we could get back to Pyongyang in time that same day to see the birthplace of the eternal chairman. But I guess I should be grateful that I even got to see four sites. A row of tourist faces looked out over the locked gate of their hotel compound in Kaesong. Beyond it North Koreans passed by, walking or cycling their way to work – but their gaze was fixedly averted away from the tourists. A policeman "directed" the non existent motor traffic. On the other side of the T junction the rows of attractive stone houses with low tiled roofs receded into the distance. But all thought of communication with the locals or wandering along those streets was useless – we were “imprisoned” in our hotel as this was tourism North Korean style! But, if you go to DPRK you just have to accept these restrictions, you may try to break or just stretch them but you probably don’t want to get your guide into trouble – ours was a lady who was certainly no party hack but just someone trying to make a living in this very strange society – naïve and propagandised yes but also intelligent, not “pushy” of the party line and generally very pleasant and “nice”. I wonder how ICOMOS will view Kaesong’s application for inscription? I am still rather amused at the recommendation after its visit to the Koguryo Tombs which were inscribed in 2004 that a “Visitor’s Management Plan” should be produced. For goodness sake - visitors here are the most “managed” anywhere in the world!!!! No one (foreigners or locals) goes to see ANYTHING in an uncontrolled way! ICOMOS/UNESCO seemed prepared then to overlook even matters of authenticity (“These (tombs) are certainly new, but are part of the presentation and interpretation of the sites – not pretending to be an authentic element, nor compromising the cultural values”) Oh yes – tell that to Dresden with its new bridge!! And UNESCO bent over backwards to solve the political problem between DPRK and China re “ownership” of the Koguryo heritage. So it would appear that UNESCO wants to try very hard (probably justifiably) to bring DPRK inside the world wide “Heritage Family”. If that is so then Kaesong is likely to receive a “fair wind” in July 2008. We were eventually allowed out of our hotel (The Kaesong Folk hotel which is designed to look like an authentic street of Korean houses) for the c13km drive to King Kongmin’s Tomb. DPRK “majors” on tombs (as well as sites said to be connected to the “Great” and “Dear” Leaders – though these may well have to wait until 2108 to be inscribed as illustrating “a significant stage in human history”, viz One-party charismatic rule – unless of course the worst has happened and everyone lives in such a state by that time!). This tomb is attractively situated on a hill side (photo 1) and the journey there was as interesting as the visit itself as it passed through an active farming area full of “brigades” of workers harvesting with hand tools – enabling some surreptitious photos to be taken from the coach windows! King Kongmin was the 31st king of the Koryo dynasty and ruled from 1352-1374. His tomb is mentioned in this nomination among various sites in and around Kaesong, which was Koryo’s capital from 918-1392. How authentic it is I know not but it was interesting enough and this era of Korean history is not represented on S Korea’s list either, though the earlier Shilla (Gyeongju) and the subsequent Chosun (Changdeokgung) dynasties are. So it is a gap which should be filled. The main reason tourists are taken to Kaesong is to visit the DMZ. This we did after the Kongmun tomb visit and then returned to Kaesong for our lunch. Unfortunately we were never given a chance to visit the old town. Instead we were taken “unto a high place” to view (yet another) enormous gold statue of the “Great Leader” and numerous stones carved with his sayings. This was set in a pleasant park above the town. We dispersed like an opened can of worms away from our guide hoping to get to somewhere more interesting – but to no avail. A cliff barred our descent to the old town and I had to make do with a few photos of what looked to be an interesting area (photo 2) of old looking buildings (though all are probably post Korean War as Kaesong exchanged hands several times during that conflict). Then it was back to Pyongyang on a 3 hour drive along the 4 lane but totally deserted highway – another surreal experience in this amazing country. Goryeo : Criterion (iii): The Historic Monuments and Sites in Kaesong are exceptional testimony to the unified Koryo civilisation as Buddhism gave way to neo-Confucianism in East Asia. LGBTQ culture: Mausoleum of King Gongmin - "King Gongmin (1325–1374) of Goryeo is on record as having kept several wonchung ("male lovers") in his court as “little-brother attendants” (chajewhi) who served as sexual partners. After the death of his wife, King Gongmin even went so far as to create a ministry whose sole purpose was to seek out and recruit young men from all over the country to serve in his court."